There are several ways to set tabs in a Word document. A quick way to set tab stops in your document is to click the ruler where you want the tabs to appear. If you don't see the ruler at the top of your document, click View > Ruler to display it. Click the ruler where you want a tab stop. For example, click 1, 2, 3, 4, and 5. Now, when you press the TAB key, your text will line up with the tabs you've set. 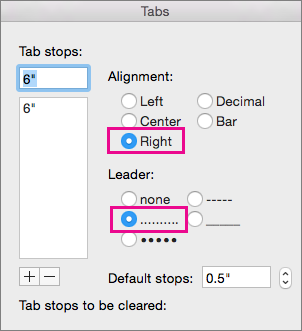 Note: To adjust the position of a tab, drag it right or left along the ruler. With a hanging indent, the second and all the following lines of a paragraph are indented more than the first. On the ruler, drag the upper triangular part of the lower marker to the place you want the indentation to start, for example to the 1" mark. The space between tabs can show dots, dashes, or other "leader" characters to line up information. Click the lower edge of the ruler where you want to set the tab. On the Format menu, select Tabs to open a window with tab options. Under Leader, select the dotted lines option, and then click OK.
Now you can add entries and when you press TAB, a dotted line will appear across the page, to the 6" mark. The formatting will be added to each new line until you change the leader. To change the formatting so no leader appears, follow steps 3-5 and under Leader, choose none. A Left Tab stop sets the start position of text that will then run to the right as you type. A Center Tab stop sets the position of the middle of the text. The text centers on this position as you type. A Bar Tab stop doesn't position text. It inserts a vertical bar at the tab position. Select the text in which you want to set a tab stop. Tip: To set a tab for an entire document, select all text. The keyboard shortcut is + A . On the View menu, make sure there's a check mark next to Ruler. Click the tab selector at the left end of the ruler, and then click the type of tab that you want. Click the bottom border of the ruler where you want to set the tab stop. If you want your tab stops at precise positions that you can't get by clicking the ruler, or if you want to insert a specific character (leader) before the tab, you can use the Tabs dialog box. At the far left of the horizontal ruler, click , and then click Tabs. Under Tab stop position, type the location where you want to set the tab stop. Under Alignment, click the type of tab stop that you want. To add dots with your tab stop, or to add another type of leader, under Leader click the type of leader that you want. Select the text from which you want to remove a tab stop. Drag the tab marker off the ruler.